Emmanuel Valenciano, 24, a Biology major at SF State, applied for the Deferred Action Program on Aug. 15, 2012. Valenciano came to the U.S. from the Philippines when he was 13 years old to be with his mother, who was working as a caregiver in the Bay Area. Valenciano decided to open up about his immigrant status after joining ASPIRE and IDEAS, two organizations that work as advocates for immigrant students. Photo by Jamie Balaoro. President Barack Obama’s unilateral change to immigration enforcement policy announced June 15 could afford many undocumented students an opportunity that most U.S. citizens take for granted – the chance that they may one day be able to legally work in their fields of study. 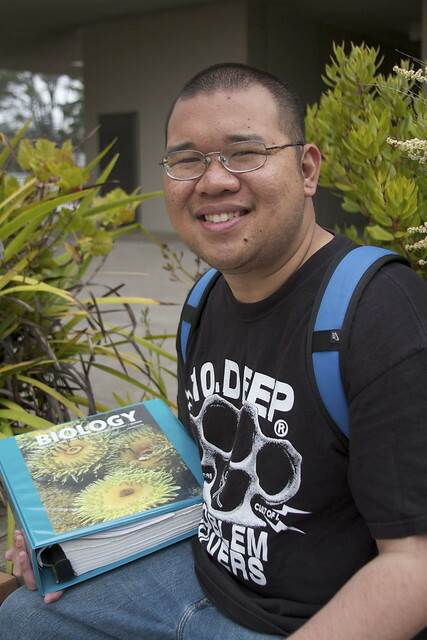 “It’s awesome that we have something like this, and it’s hope for the future for us,” said Emmanuel Valenciano, an undocumented SF State biology major who applied for the new Deferred Action for Childhood Arrivals program on Aug. 15, the first day the forms were available. The program does not formally change any U.S. law. Rather, it is a discretionary directive to defer for two years the deportation of law-abiding undocumented immigrants who were brought to the U.S. as children and who are current students, high-school graduates or GED holders or honorably discharged veterans. The program also allows qualifying undocumented immigrants to apply for temporary work permits. For one undocumented SF State nursing student who asked only to be identified as “Anne” because she fears repercussions from immigration enforcement and her community, deferred action relief means a chance at a nursing career. Anne applied for the DACA program a few days after forms became available on Aug. 15. While many undocumented young people are as elated as Valenciano about the unexpected DACA program, they remain skeptical and even fearful of Obama, who has presided over tens of thousands more deportations than any other president through the controversial Secure Communities, or S-Comm, program. S-Comm requires local police to automatically send the fingerprints of anyone they book to the Department of Homeland Security. Despite long-standing DHS policy not to deport law-abiding or low-level offending undocumented immigrants, more than one quarter of those deported through the S-Comm program in California have never been convicted of a crime, according to Immigrations and Customs Enforcement data. The California Assembly and Senate have answered S-Comm with the Trust Act, or AB 1081, which would require local law enforcement to cooperate with ICE only in cases in which the undocumented immigrant has been convicted of a serious felony. State representatives sent the Trust Act to Gov. Jerry Brown on Aug. 24, who has never stated whether he will sign or veto the bill. The DACA requirement that undocumented residents register themselves and family member information with U.S. Citizenship and Immigration Services, a bureau of the same federal department that oversees immigration deportations, is an additional source of worry. “That has been fueling a lot of the confusion and skepticism,” Said Jen Low, Immigrants’ Rights Community Advocate at the Asian Law Caucus, one of many San Francisco community organizations offering help to immigrants applying for the DACA program. “We believe that the Obama administration is doing this in good faith and that they will not hand over family member information to ICE,” she said, using the acronym for U.S. Immigration and Customs Enforcement.